It was around 11 a.m. on Oct. 1, 2015, when the news broke about the shooting at Roseburg’s Umpqua Community College. With 10 deceased and seven injured, the event is Oregon’s deadliest mass shooting. On that same morning, less than 70 miles north of Roseburg, UO School of Journalism and Communication educators Lori Shontz and Nicole Dahmen were participating in the Experience Engagement conference, hosted by the SOJC’s Agora Journalism Center, when they heard the devastating news. As they discussed the relationship between journalism and the community with the other conference attendees, reporters from Eugene and around the country were preparing to cover the story in Roseburg. By the time they had heard President Obama’s address to the nation, during which he referred to both America’s mass shootings and their media coverage as becoming “routine,” Shontz and Dahmen decided that they wanted to help — not only the victims and their communities, but the journalists who cover tragedies like the Roseburg shooting. “Intellectually, the question Lori and I were asking was: What is a journalist’s responsibility, and how do we balance that moral imperative of seeking the truth with minimizing harm?” Dahmen said. To answer that question, Shontz and Dahmen launched the Reporting Roseburg project. Reporting Roseburg compiles the stories of 19 local journalists — SOJC students and newsroom professionals alike — in an attempt to recognize the diverse and poignant experiences of those who cover tragedies. Shontz and Dahmen edited 30 hours of footage and sorted it into 13 categories, from newsbreaks to community response, emphasizing the range of discussion about traumatic events like the UCC shooting. Shontz, a journalism instructor, and Dahmen, an assistant professor, work with aspiring journalists on a daily basis. “I think an important part of any journalism curriculum is preparing students — at least in the back of their heads — so that someday when they get that call, they’re ready for it,” Shontz said. When the UCC shooting occurred, Scott Greenstone was the unsuspecting journalism student who got “that call” Shontz was referring to. Greenstone was running social media remotely for The News-Review in Roseburg, where he had interned the previous summer, and his boss asked if he wanted to cover the shooting. When Greenstone was on the UCC campus, he realized he had underestimated the bigger picture and national attention of the incident. Reporters from The Oregonian, Washington Post, CNN and even stringers from The New York Times were shooting photos and taking notes shoulder to shoulder with Greenstone. “It was the first time I realized why they call it a ‘media circus,’” Greenstone said. In his state of surprise, Greenstone made a few spur-of-the-moment calls, first to his father and then his mother, leaving them both long and heartfelt voicemails. The chronicles of the day of the UCC shooting helped to mold the objectives for the Reporting Roseburg project. According to both Shontz and Dahmen, one of the main intentions of the project is to act as a guide for journalists like Greenstone and to provide a place of understanding. The stories of Reporting Roseburg reveal the emotionally difficult responsibilities of the job: talking to the affected community, calling distressed family members and knocking on strangers’ doors. Reporting Roseburg — a resource for students as well as a useful tool for educators and professionals — addresses the difficulty many journalists have with balancing adrenaline with tragedy and emphasizes the importance of processing and reflecting on emotionally complex issues. 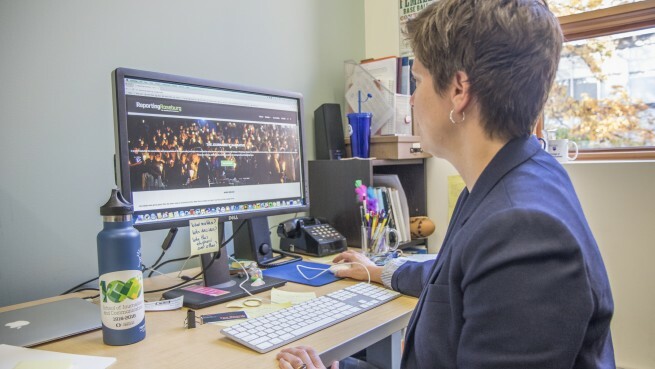 With funding from the Agora Journalism Center, Shontz will continue her work of encouraging conversation about media coverage of U.S. tragedies. Shontz also plans to continue to do work investigating the effects on a community of suddenly entering the national spotlight following a tragedy, and she and Dahmen both plan to use Reporting Roseburg in future journalism courses. Although they recognize that genuine reporting expertise comes from outside the classroom, they hope the project will continue to provide awareness, encourage preparation and heighten reflection for journalists everywhere. Carleigh Oeth is a senior studying journalism in the SOJC. She is from Portland, Oregon, where she held an editorial internship with the city’s local arts magazine, Artslandia, during the summer of 2016. This is her first year as a part of the SOJC’s communications team, and she is also working as an associate editor for the Daily Emerald. You can view some of her work on her online portfolio and visit her on Instagram @carleighoeth.